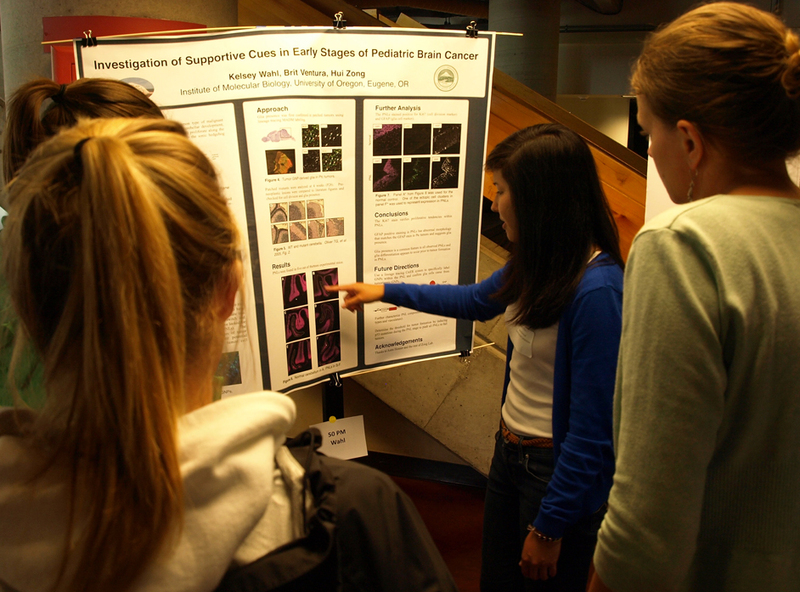 There was extra foot traffic and mingling crowds all day on Thursday, May 16, in the Erb Memorial Union as students gathered to share their research efforts during the third annual Undergraduate Symposium. Student poster exhibits filled the EMU's concourse and concourse lounge, offering visitors the opportunity to look over descriptions of student research and ask them questions about it. Kimberly Andrews Espy – UO vice president for research and innovation, and dean of the graduate school – delivered the day's keynote address during a noon luncheon in the EMU Ballroom. "We're delighted that this year's symposium continues to celebrate diverse research from many fields of inquiry," writes Karen Sprague, vice provost for undergraduate studies, in this year's program. "We have a total of 98 students participating through 39 posters and 47 talks," she said. "The range of questions and ideas that motivate your work is remarkable -- from the way Bornean orangutans use gestures to communicate, to the influence of the 1946 National School Lunch Act on scientific nutritional standards, to how catalysts may help break down plastics and other polymers." The talks were 10-13 minutes each, followed by discussion and questions. Many of the talks will focused on research efforts made locally by UO students. Among them: “United Way of Lane County's Promise Neighborhoods and the Benefits of Reading Readiness”; "Evaluating Oregon White Oak Habitat Restoration Projects in the South Eugene Ridgeline"; and "Delta Ponds Riparian Restoration Assessment." Others looked at campus issues, including on the thermal comfort of Deady Hall and a case study of the UO's quest for a smoke- and tobacco-free campus. A biology student covered the opposing roles of two proteins in the regeneration of caudal fins in zebra fish. Political talks included one on Guantanamo and another on World War II's impact on welfare polices in Great Britain. From education, a student addressed "The Effect of Learning to Sew on Self-Esteem, Self-Efficacy, and Optimism in Adolescent Girls,” and a talk from a music student covered Japanese music and dance as a global culture. The full program is available via a link on the Undergraduate Symposium's website. The daylong symposium is the centerpiece for the UO's second annual University of Oregon "Celebrate Undergraduate Achievement Week" that began Monday with events at various locations on campus that showcase undergraduate accomplishments. The Division of Undergraduate Studies, Center for Multicultural Academic Excellence, University Housing, Robert D. Clark Honors College, UO Libraries, Office of Institutional Equity and Diversity, and Division of Student Affairs are sponsors of the Undergraduate Symposium.